Worry, it’s what Oregon fans do. It’s what all fans do, really, but Oregon fans are specialists in it. The assumption is, if something bad happens, no matter how small, it will trigger a catastrophic outcome. If things go well for a while, it means something bad is just around the corner. They will ultimately be deprived of joy, for no logical reason other than they’re Oregon. So it was late last week, when receiver Darren Carrington was ruled ineligible for the National Championship Game. Panic, fear, blame; all were emotions that ran their course through the fan base on the same plane of worry. While my first thought was, “Of course the NCAA (the one run by a Husky, by the way) would do that just days before the biggest game in recent memory.” Then it made me think of The Simpsons episode Lisa the Beauty Queen. Kent Brockman (on TV): Lisa Simpson is no longer Little Miss Springfield. She was stripped of her crown in a ceremony earlier today…the father of the deposed beauty queen, Homer Simpson filled out the pageant application incorrectly. 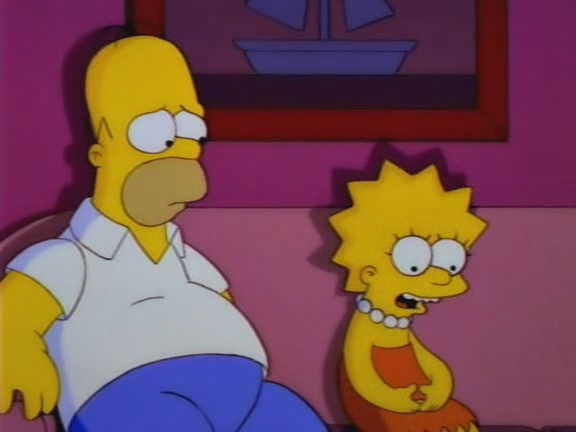 Lisa: Dad, do you remember why you entered me in that pageant? Homer: I don’t know. Was I drunk? Lisa: Possibly. But the point is, you wanted me to feel better about myself, and I do. Homer: Will you remember this the next time I wreck your life? That episode reminds us that we can’t look at tonight’s game from the filter of where the season is now, but rather from where the season began, through a lens of the preseason narratives that the cynical fans believed and the optimistic feared going into the season. The Ducks celebrate a touchdown against Michigan State. 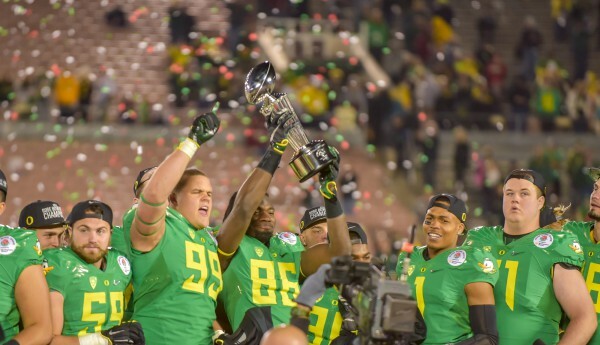 Narratives like Stanford had eclipsed Oregon as the kings of the Pac-12. That the Ducks were a gimmick that teams had begun to copy and solve. That Mark Helfrich and Don Pellum couldn’t replicate the feats of Chip Kelly and Nick Aliotti. That Oregon could score all over most team, yet still couldn’t beat physical defenses. The goal for this season was never about hoping for a national championship. It was about resolving whether or not maintaining dreams of a national championship were a realistic possibility. 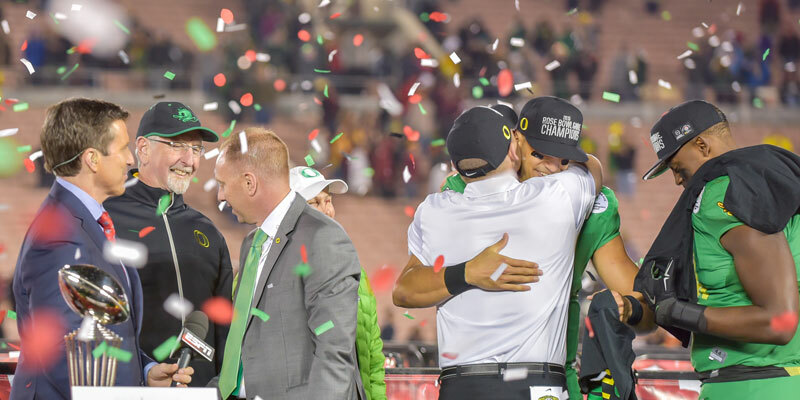 The concern over whether the previous two seasons were a hiccup or a trend; to see if the best days of the program lay ahead or behind the Ducks. When we look at it from that lens, the season is already a resounding success. That’s not to say that the Ducks should be content, or that National Championship Game appearances are commonplace. This is still the biggest game in the program’s history. But Oregon’s appearance in the title game no longer needs to carry a “Butler Bulldogs“-level weight; the outlier who can only crash the party only if one of the other bluebloods didn’t bother to show up. 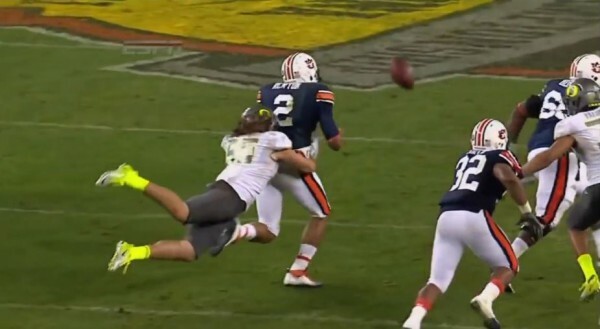 Any discussion about the BCS is an excuse to break out this image one more time. That mindset is a relic from the BCS era. It’s not a coincidence that after having five first-time national champions (Colorado, Georgia Tech, Washington, Florida State, and Florida) in the eight seasons prior to the creation of the BCS, there were no first-time champions in the entire 16-year history of the BCS. In fact, only two schools (Virginia Tech and Oregon) were even given the chance to play for a first-time national championship during that time. Despite their claims, the BCS was never a system designed to create a true champion; the BCS existed to reinforce the already flawed logic of college football’s power structure. Once college football decided to issue its first attempt in its 145-year history at something resembling a meritocracy (and even TCU and Baylor might argue against that), the Ducks did what they and their fans always knew they could do if given the chance to prove it: win. Fans can be forgiven for worrying about the outcome of tonight’s game, because change, including mindsets, comes slow. It is hard not to worry about tonight, when under the old BCS system an Oregon loss would have represented some kind of failed ending to the season; a heartbreaking loss in the worst possible game for it happen. While such a loss tonight would still be disappointing, under the old system, Oregon doesn’t even get there. The Ducks may not be the national champions after tonight, but under the old system, they definitely wouldn’t have been. Under the old system, tonight’s game never even would have been presented as an opportunity for a win. Yet in that scenario, Oregon’s current season is considered a resounding success: 13 wins, a conference title, and a Rose Bowl victory. Fans would complain that the Ducks deserved to be in the title game, but would be pleased with the outcome of everything they could control. With Oregon already gaining all those achievements and still having a shot at the title, tonight’s game is house money. Celebrating the big win over Florida State. Change may be glacial in college football, but it is inescapable. Programs like Oregon push change, and the structure pushes back. Change occurs far slower than fans and programs may wish, yet faster than the structure desires. It never occurs when we want it, and only in retrospect can we see its significance. For 37 years, Oregon fans wondered if they could ever win the conference again, in 1994 they did. 2001 left them feeling like the Ducks would never be allowed to play for the title; 2010 changed that. After 2007, Oregon fans felt their best chance at a Duck winning the Heisman Trophy had vanished, only seven years later Marcus Mariota would win the award by the second-highest margin ever. For 95 years, fans wondered when the Ducks would win a Rose Bowl again; now they have won two of the last four Granddaddies. All were achievements that felt like they could never happen, until they did. Change may take time, but its shifts happen quickly. The SEC dominated college football for nearly a decade, only to watch its claim evaporate in a single bowl season while the Pac-12 took its place. If the outcome tonight is unfavorable, as long as the Ducks stay near the top of the nation’s best conference, they will have chances to play their way to the title every year. So don’t worry about tonight’s game, fans. If Ohio State wins tonight, it’s just another championship for a college football blueblood in a game Oregon never would have been picked to play in anyway under the old system. If that happens, it will be another result of the way college football has always been. But maybe, just maybe, change happens tonight. If it does, things will never be the same again. Top image by Craig Strobeck.